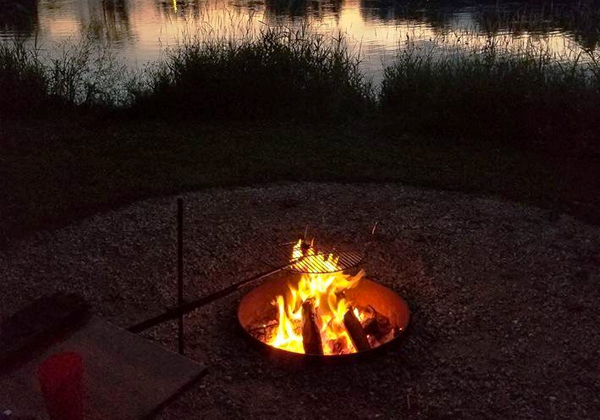 When you camp Memorial Day, Independence Day or Labor Day weekends in 2019 get a fifth weeknight free when you’ve paid for four nights! Camp anytime during the rest of the camping season get a fourth weeknight free when you’ve paid for three nights!! This offer applies to sleeping cabin rentals too!! No Pets and No smoking in cabins. 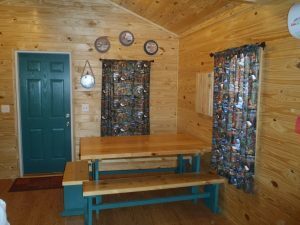 Two night minimum for cabin rentals (add $20 for one night if available). Enjoy the day with Early Arrival from 9:00 a.m. to 12:00 p.m. for $20 if your cabin is available. Stay and Play with late checkout (till 8:00 p.m.) for $20 if your cabin is available. Reservations require a 2-night minimum (3-night minimum Memorial Day & Labor Day). Extra Tent for kids. If there are only one or two adults registered on the site, then one extra tent may be setup up for kids at no extra charge. If there are three or more adults, then an extra tent is $50 per night in addition to the extra adult $10 fee per adult. A maximum of 6 adults (21+) on a site. Choose from 15 sleeping cabins. No pets and No smoking in any of the rental cabins. Cabins A, B, C, G, H & I are Waterview cabins. Cabins D, E & F are standard cabins. 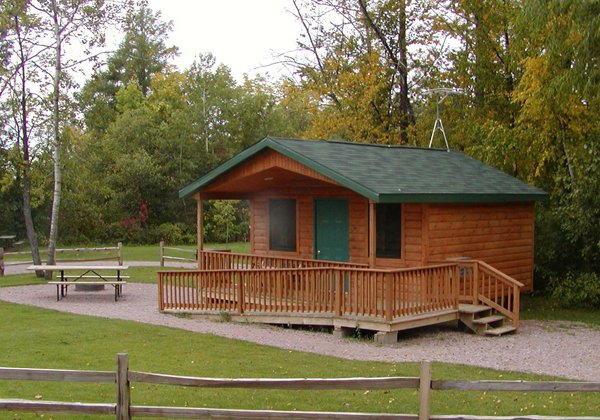 Cabins A through I are located near the bathhouses and do not have indoor running water, bathroom or kitchen. Cabins A, B, C, D, E & F are 14’x14’, sleep 5 people with two double beds and one single bunk bed. Cabin G is 16’x16’, is handicap accessible and is located next to the ADA compliant Totem Field bathhouse. It sleeps 6 people with two double beds and two single bunk beds. Cabins H & I both sleep 7 people with one queen, one full, and three single bunks. Cabins K, M, N, O, & P are Waterview cabins, sleep 5, (cabin Q sleeps 3) and do have a kitchen sink and bathroom. All cabin interiors include a table and benches for your dining pleasure, a microwave, TV, DVD player, refrigerator & freezer, ceiling fan and heater/air-conditioning unit. Outside there is a 6 foot covered porch, park bench, cooking grill, fire pit, picnic table, and fresh water faucet. You need to bring along your own bedding. 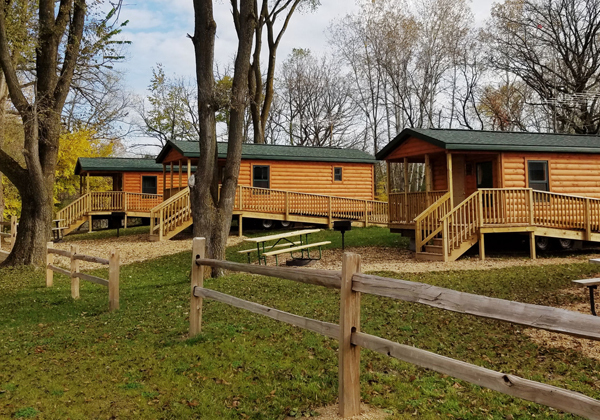 If you would like to see inside one of the cabins just stop at the camp office and ask about getting a key if the cabin is not occupied. We are pleased to offer a larger cabin with a wheelchair ramp. It is located next to the Totem field ADA compliant bathhouse, making it easier for disabled guests to enjoy the camping experience. This cabin sleeps six and has the same amenities as the other cabins. It also has a nice view of the lake. Price for 2 adults and up to 3 minor children. Sleeps 5. Price for 2 adults and up to 4 minor children. Sleeps 6. Wheelchair ramp. Price for 2 adults and up to 5 minor children. Sleeps 7. Price for 2 adults and 1 minor child. Sleeps 3.